Shopping online through smartphones is expected to be a game changer shortly and industry experts believe that m-commerce would contribute up to 70 per cent of their total revenues. "In India, the mobile internet traffic now outweighs personal computer traffic. With increasing penetration of smartphones, India is all set to be a massive market for m-commerce. The marketing strategies for e-commerce companies will increasingly be tailored to suit the rising adoption of smartphones, social media and improving customer experience across touch points and platforms," Amazon India Vice President and Country Manager Amit Agarwal told PTI. He said that more than 40 per cent of their traffic comes from mobile devices. Mobile internet users in India are estimated to be 120 million compared to 100 million users using internet on their personal computers. 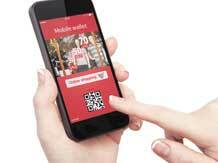 "Close to 60 per cent of our orders are coming over mobile now. It is growing really fast. We get more traffic on the mobile than we get on personal computers. Within the next 12 months over 75 per cent of our orders will be on mobile," Snapdeal co-founder Kunal Bahl said. Fashion portal retailer Myntra.Com expects close to 70 per cent of revenue coming through mobiles this fiscal. "Myntra.Com has witnessed phenomenal activity on the m-commerce front, with smartphones gaining prominence as the preferred mode to access and shop for fashion brands in the country. "Currently, close to 50 per cent of our business is driven by m-commerce and with the launch of our Mobile App across all platforms (Android, iOS and Windows), we expect this figure to grow to 70 per cent by end of this fiscal," Myntra Chief Product and Technology Officer Shamik Sharma said. M-commerce is estimated to be 30 per cent of the $3 billion e-tailing industry and is likely to grow to nearly 40 per cent of the industry that is expected to be 32 billion by 2020, according to Technopak Senior Vice President, Retail and Consumer Products Ankur Bisen. Flipkart Senior Director Marketing Mausam Bhatt said e-commerce industry is gradually progressing to be a m-commerce industry. "I think the way e-commerce industry is evolving it is becoming more of a mobile-commerce industry. If you look at Flipkart a year ago, less than 10 per cent of our orders, transactions and visits used to come from mobile commerce. "Now those numbers are greater than 50 per cent for us. It is accelerating at a very rapid pace. We are seeing more than 2 times or 3 times growth from the mobile front compared to desktop, where Flipkart is growing overall but mobile is growing at a much faster pace," he said.